Anyone can find themselves suddenly overwhelmed if they don't manage their money correctly. No matter what game you are playing, there are some tips that are out there that will keep you from spending more than you intend. First, don't try to make up what you lose. I know it sounds difficult to stop, especially if you are feeling like you're about to make a winning, but the risk is just too big. You'll end up spending more money than you want just because you want to make that money back. In truth, that's how the casinos want you to feel, they want you to keep playing and spending your money. Second, stick to a strict budget. Have a set dollar amount that you are ready to spend in mind. No matter what happens, you must stop after you reach that limit. This keeps you from overspending and regretting impulse decisions later on. Third, stop when you're ahead. This may even be tougher than stopping to make back a loss, but you have to quit while you are ahead. You're winning streak will only last for so long, and you'll end up losing that money you earned. Take a step back and enjoy your winnings before you get too greedy and end up losing it all. Finally, don't be fooled by betting systems. Even though these systems sound like they are practical, they are not failing proof. For example, the Martingale is a widely known betting style. It states that every time you lose double your bet so that you win that money back. Even though the strategy sounds like it can succeed, it is more likely to fail and cost you money. Blindly following a betting strategy will only result in losses for you. Use your brain and think about each consequence before you act out on it. 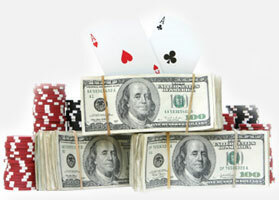 Video poker is a game that is growing in popularity recently, making it an ideal example on how to manage your money. When playing video poker, everyone wants to get a Royal Flush. Statistically speaking, this occurs once every 40,000 hands. Even though this is not going to be accurate all the time, it gives you a perspective as to how unlikely the odds are. The reason why this information is important is because it helps put things in perspective. Gambling is fun, but don't expect to make any money from it. Yes, you can win and you may win big, but you can lose as well. Because of this, it is important that you don't get carried away and lose all of your money. Play smart; don't let the game take control of you.